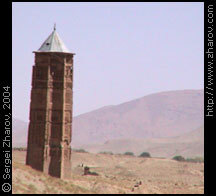 In the 7th century Ghazni was a lively center of Buddhism, but then the Arabs have come. The population fought bravely, and this is why the city has been totally destroyed in 869. The Arabs themselves have restored it and turned it into a capital of a giant empire that included India, Iran, and Central Asia. But in 1151 they have destroyed everything once more. And rebuilt it again. And — you can guess it — Genghis Khan has finally destroyed it forever in 1221, and it was not rebuilt after that. The city is known for its two ancient minarets built in the beginning of the 12th century. They are all that remains from ancient mosques in that area. The mausoleum of Sultan Mahmud who died in 1030 is worth seeing. It is a plain building with a coffin and other things inside. I was unable to find the palace of Sultan Mas'ud and the museum of Islamic art that were supposed to be here. They may be gone by now. Tapa Sardar is a hill with a giant Buddhist stupa on the top. The stupa has been built at least in the 7th century. It actually is a big structure complete with other small stupas and temples. You need a written permission of the governor to see it — the guards politely ask you to get lost without the permit. There is a modern-looking hotel at the intercity taxi station on the main road, but prices are two high. Moving farther along the road and crossing a bridge you will see Spinzar Hotel on the left side. Rooms are about three dollars, and they do not overcharge foreigners. Beds are on the floor, and the bathroom is communal. Spinzar Hotel has a nice, big restaurant with standard choices of kebab and pilau. The locals gawk at foreigners there but they do that politely. The only other restaurant discovered in the city is a small establishment on the road to the old city. If instead of crossing the bridge to Spinzar you turn left before it, you will get to a square. Streets on the left side of it lead to a residential area of little interest, although this is where the governor is located. Another bridge from the square will take you to a commercial area. Right after that bridge is the small restaurant mentioned above. Then there will be two parallel streets with lots of shops. You can buy nice and cheap souvenirs there. Like knives with lapis lazuli handles. At the end of these two streets there will be one more square. It contains a few antique and souvenir shops. This is the place to buy souvenirs in Afghanistan. Things made of silver and lapis lazuli are quite cheap, a dollar and up. Many shops sell old and “old” coins. Right after that square is the old city with a citadel on a hill. The citadel, as is customary here, houses the military guys, and they will not let you in. You can inspect the old city, though, but it is just a maze of old buildings. It is simpler to walk along its walls, entering the city a couple of times through the broken parts of the wall for taking a few pictures. A taxi stand is also at this square. For about five dollars you can hire a car for about three hours, which should be enough for sightseeing. The minarets are not that close, and it is not obvious which road to take to them. The minarets are clearly visible from the main road to Kabul. They are on its left side when you come from Kandahar. A dead armored carrier is half-buried at one minaret. The usual advice: do not approach it since the unexploded reasons of its death may be somewhere near it under dust. This is equally true with respect to the five destroyed tanks at the base of the minarets, to a pile of canons nearby, and to any dead military equipment in this country. Across the main road in this area is Tapa Sardar. The guards did not let tourists to inspect it citing an order by the governor not to let anyone without his personal written permission. Sultan Mahmud's mausoleum is farther to Kabul, on the same side as the minarets. Generally speaking, it is not that interesting. On the other side, there is not much to see in Ghazni anyway. If you have a car, go there. Otherwise skip it since it is too far to reach on foot. Still, there is sense in stopping at Ghazni. Depending on whether you go to of from Kabul, you get here in the evening or morning and have to leave in the morning or evening. It is quite sensible to spend a night here, visiting the sights and shopping in the morning and exploring the city in the evening. Foreigners make a modest sensation here — the adoring crowds are measured in dozens, not hundreds. The governor is a great guy. If he is still alive by the time you get there. The bus station is on the main road. Kabul: three hours, three dollars. Kandahar: eight hours, 14 dollars.